We answer nine questions about the engineering profession, gathered from a quaint little website called Reddit, in this episode of The Engineering Commons. You may notice a common thread in our responses, as there is rarely a clear-cut solution, and the answer often depends on the situation! Carmen turns to application (app) notes or textbooks for answers to many of his engineering questions. Jeff notes a constant stream of engineering questions in the Engineering and Ask Engineers subreddits that can be found on the Reddit website. A Google executive claims that GPA and test scores are worthless for predicting job performance. A video of former Microsoft CEO Steve Ballmer laughing at the iPhone is mentioned by Brian. Carmen and Brian recommend Digi-Key and Mouser for electronic parts, as well as eBay and Amazon Supply for other industrial components. In a past episode, we interviewed Todd Nelson of the Analog Footsteps website, who has a nice article about the history of electrical databooks. Carmen mentions a well-known reference book about electronics, The Art of Electronics. Our sincere thanks to those Reddit readers who upvoted The Engineering Commons in this thread about engineering podcasts! 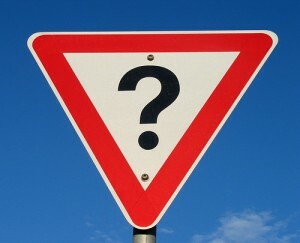 Thanks to Colin Kinner for the photo titled “Question mark sign.” Podcast theme music by Paul Stevenson. You mentioned trying out stuff before going to university. I have done a ton of stuff with electrical engineering – arduino, raspberry pi etc make getting started a breeze and there is tons of info on taking things to the next level. However, there doesn’t seem to be an equivalent starting point for mechanical engineering (for example). I have been teaching ‘bridge building’ in my schools engineering club this year to get them thinking structurally, but there is a limit to the appeal of watching wood glue dry. Any ideas on how people can get started in ME or CE without access to a machine shop? Happy to have you as a new listener! Glad you like the show! I’m not sure about Civil Engineering projects that can be done on a budget that aren’t bridges. That could be a good idea for a show though, I’ll have to do some research. Just spitballing, it might be possible to do a dam or irrigation project… Have the students successfully get water from one end of the room at the “lake” to the other end, or “city.” In between throw elevation changes and other such hazards. For ME stuff, I took a summer course for high-schoolers at a community college in between sophomore and junior year on model rockets. It was a blast shooting off the rockets and making modifications (fins, nozzles, etc.) to get them higher than before. There was some basic calculations to go along with the testing to see how close we could get our math to match with reality and be able to explain the differences. It’s something different than a bridge but finding a location and getting permission to shoot off on school grounds could be tough. Actually, the irrigation idea could work too as a lot of MEs have to deal with pumps and fluid flow in their day to day activities. Or have them build a crane to lift and move a large, relatively heavy object for the scale of the project. Then there’s statics and dynamics at play instead of mostly statics (bridge with load hanging off it). Those are some really good ideas! Rockets are cool, and easy to see improvements. Not sure how many of my student’s I’d trust near gunpowder though 😛 Building on the idea though, I have a pneumatic gun that can launch things at high speed – shooting plastic bags and figuring out a way to measure energy and speed as they hit something will be a good challenge.